The halfway room was a dark, wood-panelled affair. Breathless from the climb up, I stopped at its walls, lined with photographs of the world’s tallest religious towers in ascending order. Outside, a German visitor emerged from a stairwell and entered the room, smiling broadly. She was presumably on the way back down. I nodded and said yes. Her response was direct, precise, and in a comical way, almost cruel. 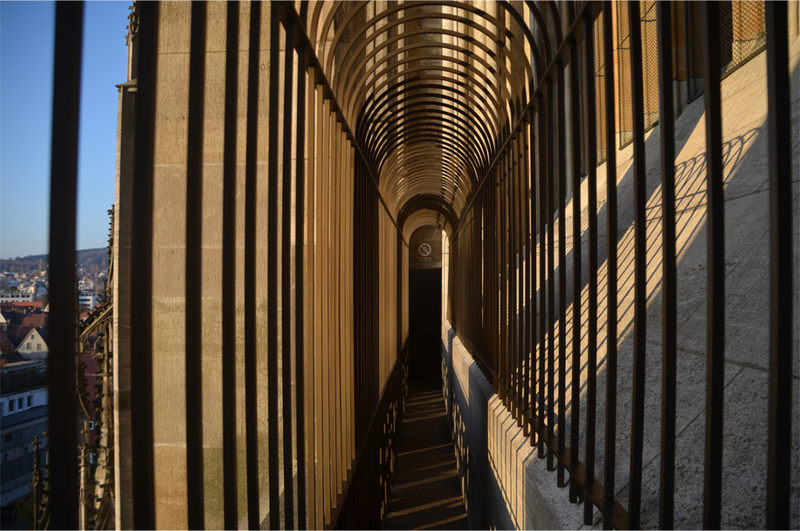 Twenty minutes earlier I had joined a small handful of other visitors whose footsteps echoed faintly in the serene interior, where the low autumn sun flooded through the stained glass windows, projecting a kaleidoscope of vivid colours onto the columns and walls. From the narthex I pried open a creaking oak door and began my ascent. 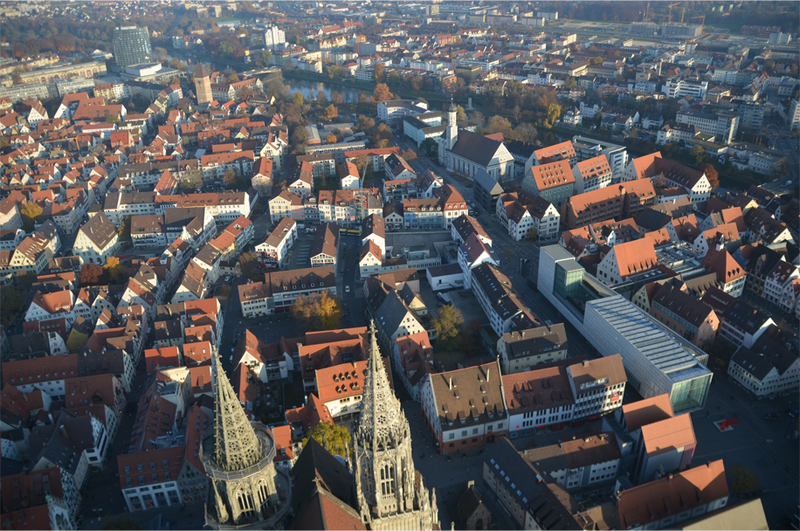 Ulm does not figure on most visitor itineraries through Germany’s southwest, but it probably should: this medium-sized city of 120,000 residents happens to be Einstein’s birthplace, and home to the tallest church steeple in the world. I had known about it ever since my early teens, when I received a tall, elongated book on skyscrapers. I spotted the spire of the Münster for the first time, reflected in a glass façade, as I walked the main pedestrian street from the train station. 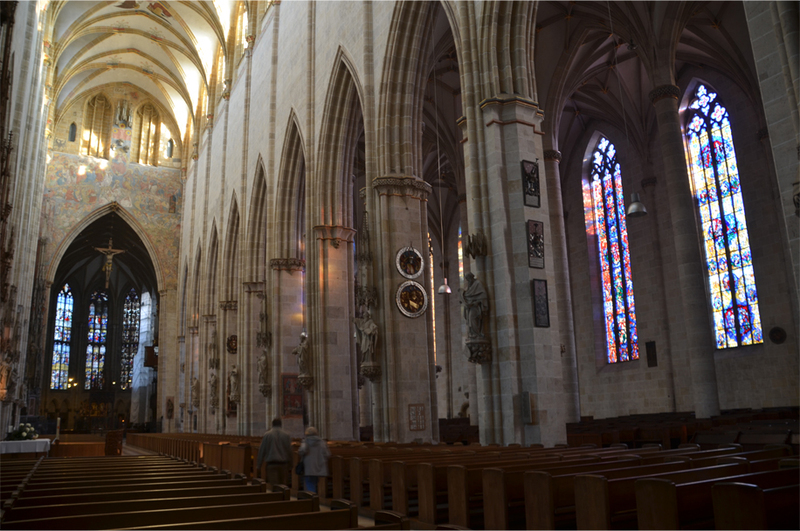 Although a vast swath of the medieval town (no less than 81%) was destroyed in World War II, the Gothic Münster remained miraculously intact. 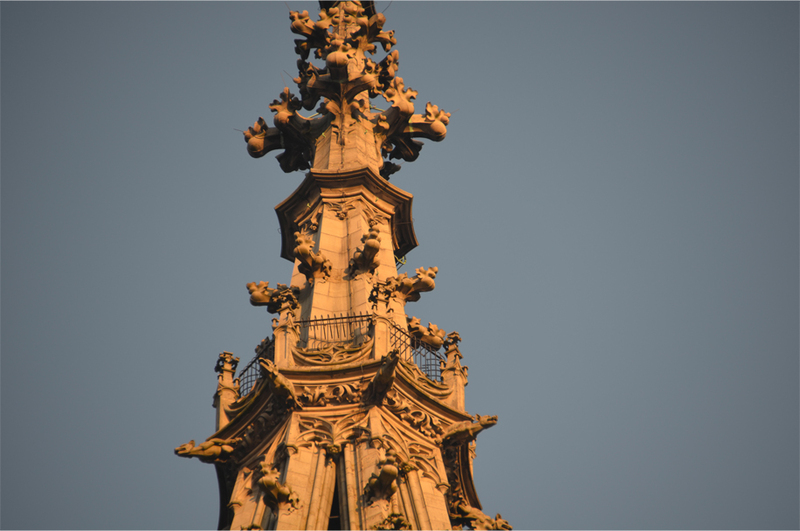 Its record-breaking height of 161.5 metres played a role in ensuring the church’s survival – the spire was used as a navigational landmark by Allied bombers. 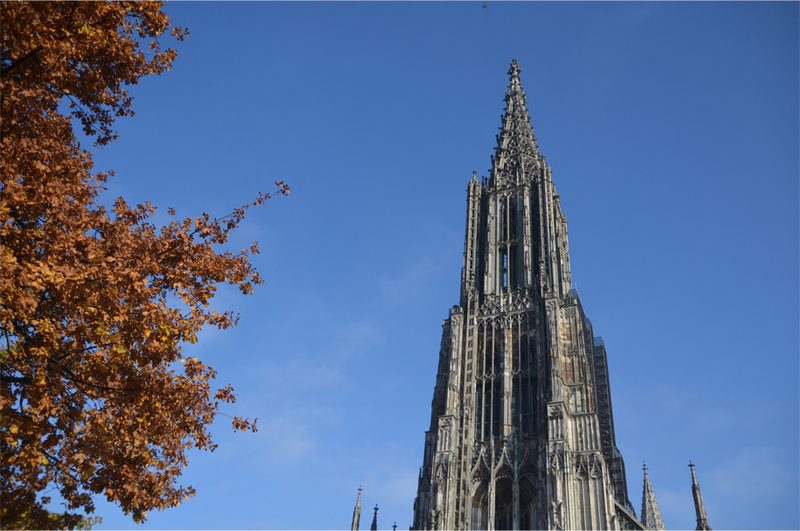 Ulm’s distinctive tower was the vision of master builder Ulrich Ensingen, who took charge of the project 15 years after the foundation stone was laid in 1377. But Ensingen would not live to see his steeple complete – and neither would many generations after him. Construction came to a standstill in 1543, as funds ran out during a time of political instability and economic stagnation. 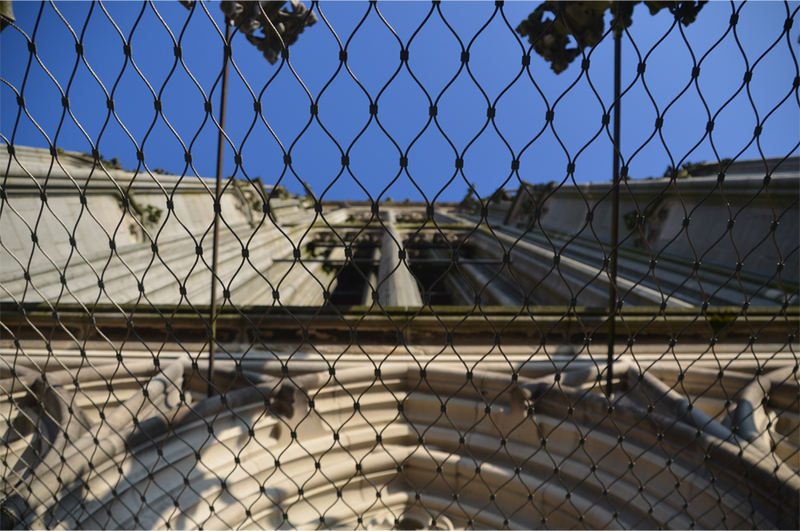 Throughout the next three centuries the spire stood at a height of 100 metres, unfinished and silent, until 1817 when building work finally resumed. A final 73-year push ended on May 31, 1890, half a millennia after its inception. 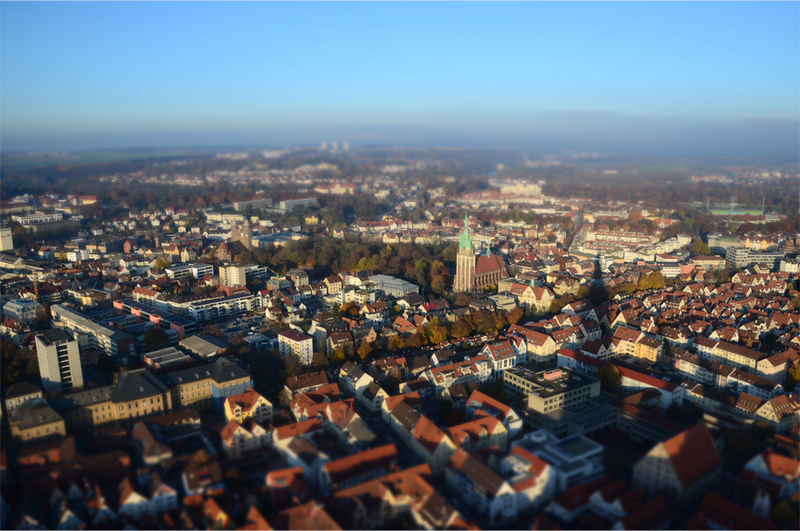 For the next 11 years Ulmer Münster would hold the title of the world’s tallest habitable building. Walking the 768 steps to the viewing gallery, it didn’t take long to realise the truth of that claim. But what was also apparent that this was a marvel of engineering: a heavy, hollow spire, supported by a seemingly weightless frame. 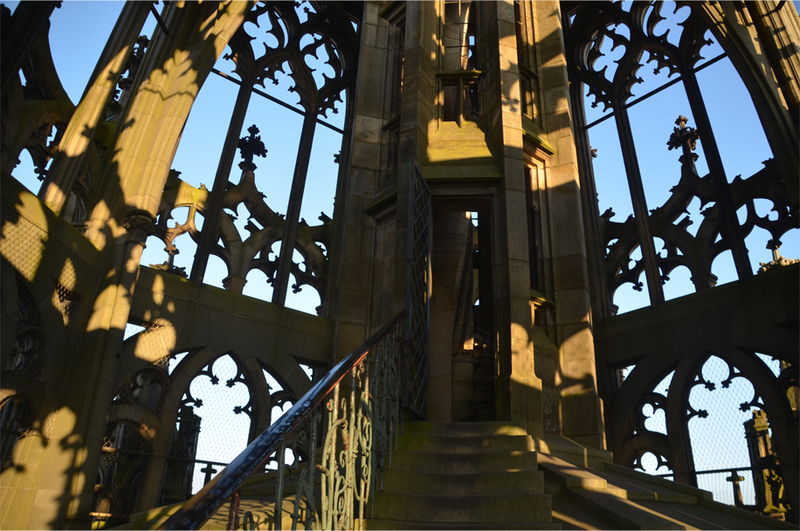 I wandered through the vertical forest of open stonework and found myself at the final stage – a spiraling staircase contained in an octagonal tower – leading up into the crown. By the end I was exhausted and gasping for air, but the views stretching out in all directions were simply unimaginable. The lady in the halfway room was right. It doesn’t look so tall here… but don’t be fooled! Wow what a beautiful building! I hope to see it in person all the way to the top! Yes, it’s definitely one for the wishlist! Thanks Suze! 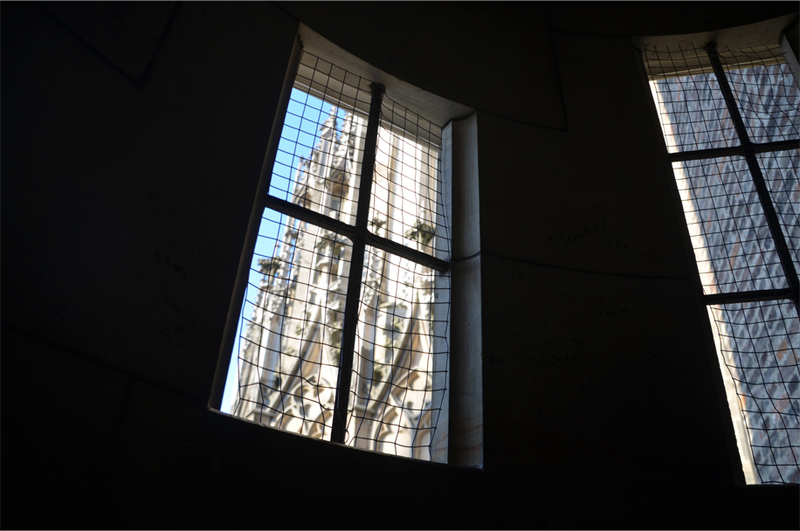 The autumn sun bathed it in such a wondrous glow, I couldn’t help staying in the Münster until closing time. 🙂 And it’s easy to take nice photos when you’re in such a gorgeous country… Germany is truly a land of fairytales! Oooo you make me wanna go there! It sounds, and looks, wonderful. Don and I would climb all those stairs in a heartbeat. I think you and Don would have a field day, taking all sorts of photos up and down the steeple! I loved the silence and solitude that was so clearly felt near the top. I visited it once a long, long time ago. Good memories. It’s a beautiful church – and so underrated too. Wow, 768 steps?! Now I can imagine how tall it is. Got to prepare myself should I go to Ulm one day. 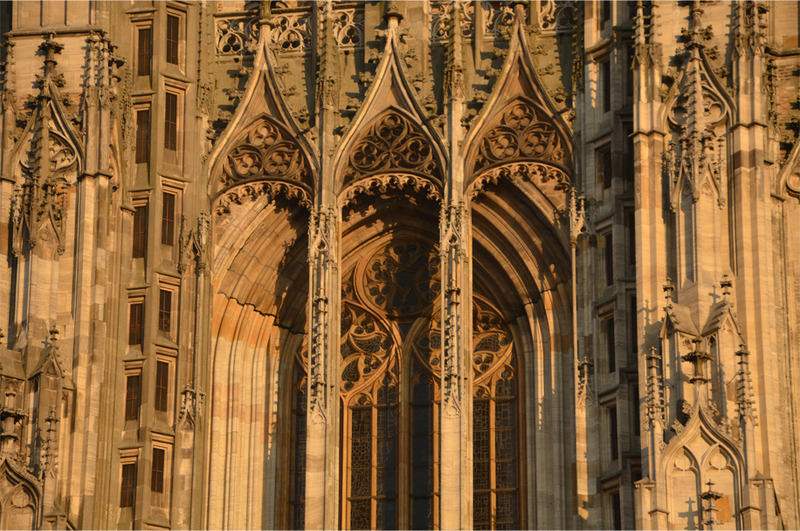 It seems like many great church architects in the past never saw the completion of their works. Ulrich Ensingen, Gaudi, those are the names that I know. But at least they are (or will be) completed at some point so we all can add more interesting places to visit in our lists. Well, with the benefit of hindsight, it was much, much easier than Rinjani! Imagine half an hour or maybe 40 minutes of stair climbing – instead of a continuous three-day trek. You’d nail it for sure, Bama! Yes the top is the hardest… I was completely out of breath and dizzy when I finally got there. But what a reward! 😀 The views made me forget about my sore legs. Wow! Thanks! Somewhere else I need to visit! I love climbing up in churches where your perspective changes and you can see architectural details! You’re welcome Terri! 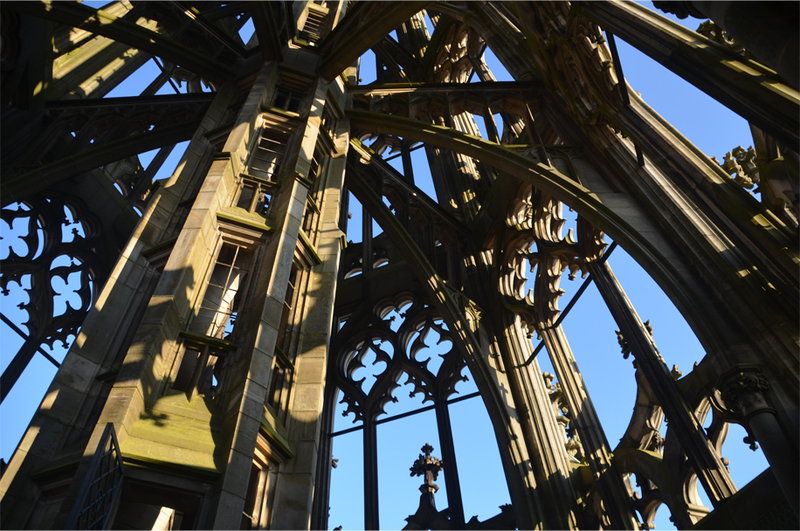 This was such a lovely structure – so monumental but graceful and delicate at the same time! That first photo actually looked a bit like the Duormo in Milan, which I love! Have you been there? I was there on a whistle-stop tour through northern Italy ten years ago – sadly we didn’t have time to go up to the roof! Well, James, don’t miss it next time. It is spectacular! Lovely hollow steeple. Um…for that outdoor viewing platform: I might venture out. I do have a slight case of fear of heights. (Unfortunately). Is there a stair rail winding up and down to protect one from the stairwell empty hollow space? I went up a 10 storey high older lighthouse by Lake Huron in Ontario. And it did NOT have a rail up the spiral inside staircase to the top. It was difficult for me psychologically to walk down the staircase without feeling I was going to fall down the dark stairwell space on the side. By the time, I reached the ground outside, my thighs were very sore…from stress and concentration. That’s what fear of heights does to a person. Absolutely stunning! I see Terri’s comment about the Duomo in Milan and I thought the same thing. The architecture is just breath taking. Looking at these churches, I sometimes wonder if we’ll ever have the same patience to create such intricate and monumental works of art! I agree! I took my first international trip this summer to Italy and was blown away by all the architecture. I feel like you don’t see buildings and structures like that in the States. 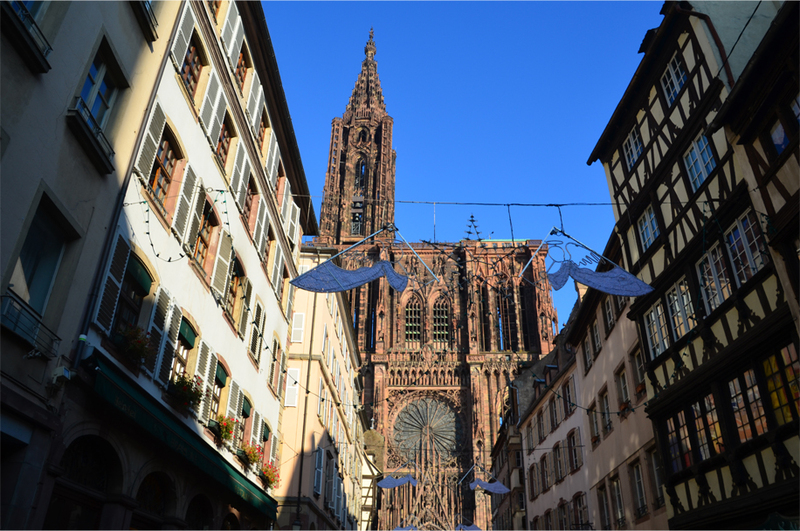 I miss walking down the streets and appreciating the beauty of the buildings! 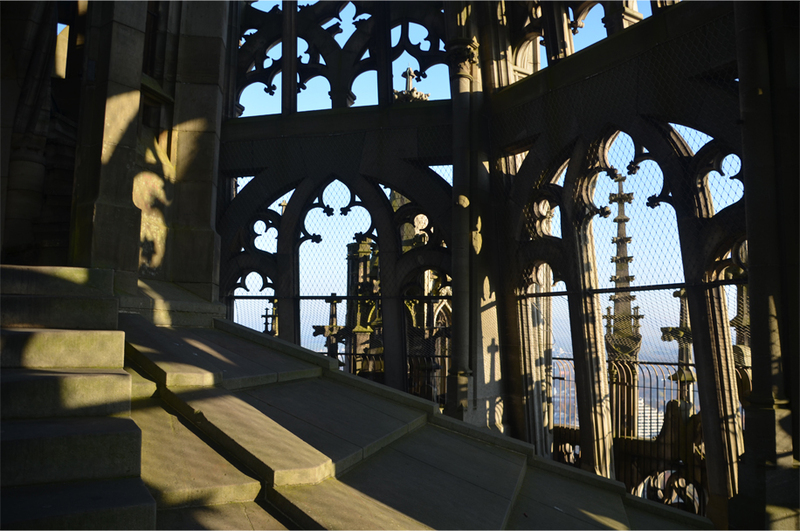 I was in Münster this weekend and I regret not going up the Ulmer Münster to see that view! :-O Lovely pictures! Thank you! 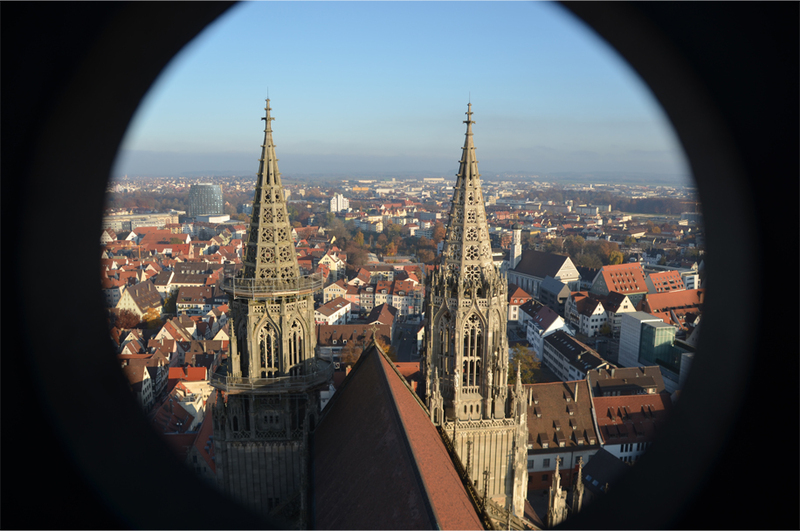 This was actually in Ulm so quite some way to the south – but I’ve heard Münster itself is a beautiful city. Looking forward to further checking out your blog! Thank you, it is a great place to visit. 🙂 Not for an entire week though, but a few days are nice! You’re right Terri, one of my favourite moments was standing inside the hollow spire – I almost couldn’t believe it was conceived all those years ago! James, I have been there decades ago, and i remember being overawed by that spire. I even remember a restaurant we had lunch at nearby, very clearly. But I have no recollection at all of the interior! No photos either except of the spire. Grateful to you for taking me back and showing me around 🙂 What a masterpiece!. Hello James, I hope you remember me. I’m Daisy Blog Writing On The Road. I will I commented recently, but I’ve always followed. You are always very interesting. In recent weeks I have made many changes to my blog and my social network accounts. Even so, I was absent from the comments. I invite you to my blog, click on the right to translate my blog and read my last post: socialize? I would like to socialize with my friends of the blog. Read and understand. Thanks for your attention! With affection. Daisy. And congratulations for the wonderful blog, as always interesting! Thanks for the message, Daisy – best of luck with the changes! I loved reading about how the Allies used the spire as a navigational aid, thus ensuring its survival! I love walking about those towers. It’s a great way to get a bird’s eye view of the city, using it to search out other parts of the city to visit! Strange twist of fate, isn’t it Stephen? I’m guessing the same thing probably happened to the cathedral at Cologne. 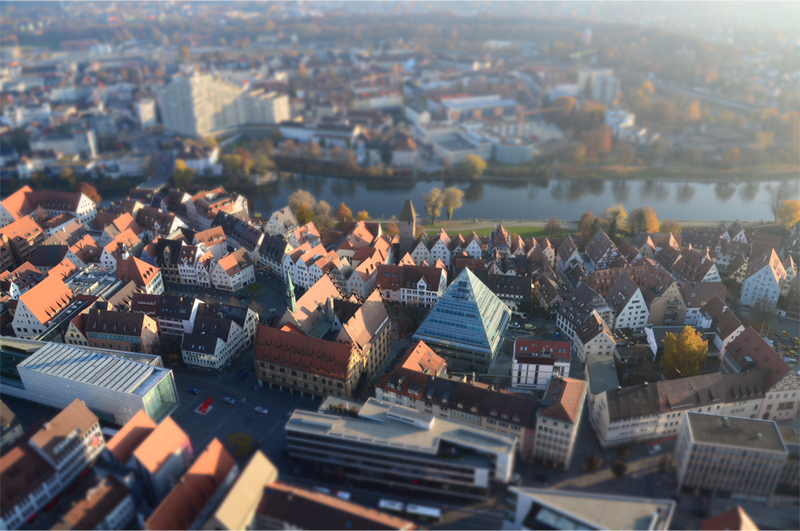 Sadly I only had a short afternoon in Ulm! Reblogged this on Bjorn Koch's Blog.